October 3, 2018, Thekchen Chöling, Dharamsala, HP, India – The majestic Dhauladhar Mountains stood resolute against the clear blue, post-monsoon sky as His Holiness the Dalai Lama walked from his residence to the Tsuglagkhang, the main Tibetan temple, this morning. The temple yard was thronged with people eager to see him, smiles on their faces and hands folded in welcome. Inside the temple His Holiness waved to the crowd, greeted the Lamas seated around the throne and took his seat. Among the 6500 people in attendance, 1000 were Taiwanese, most of them belonging to 18 cultural organizations participating in the International Association of Tibetan Buddhist Dharma, Taiwan. In addition, there were 500 Indians, 1800 people from 66 countries abroad and 3200 Tibetans. “Those of you from Taiwan have been coming for many years now and today there are people from many other places too—I greet you all. I’m going to begin with an introduction to the teachings of the Buddha. Many of you may be familiar with it, but there may also be some who haven’t heard it before. “All religions teach us not to do harm, but to have a kind heart. There are theistic traditions that believe in a creator god and non-theistic traditions that teach about karma. All of them encourage us to help others not harm them. “How do you tame your mind? The Buddhas do not wash unwholesome deeds away with water, nor do they remove beings’ sufferings with their hands and they do not transplant their own realization into others. It is by teaching the truth of suchness that they liberate beings. “A rich tradition of philosophy and psychology already existed in India at the time of the Buddha. A general belief in past and future lives was supported by the reports of individuals who had memories of their previous lives. Since the body doesn’t travel from one life to another, the question was what does? Many schools of thought posited a self separate from the mind/body combination that they called atman. Taming the mind relied on training in ethics and concentration on the basis of which wisdom could be cultivated. “Many Indian spiritual practitioners aspired to transcend the desire realm and the attachment it involves, which they considered fraught with problems. Through meditative absorption they sought to reach the subtler and more peaceful form and formless realms. “Born into a royal family, the Buddha renounced his comfortable way of life when he realized the suffering involved in birth, sickness, aging and death. He entered instead into the homeless life of an ascetic. As a result of his cultivating ethics and concentration he recognised that far from there being a single, autonomous, permanent self, the self is merely a designation. He further acknowledged that belief in a single, autonomous, permanent self reinforces clinging to it. There is a notion of a self that functions like a master over the other aspects of the mind/body combination, which operate like its servants. Therefore, the self is seen as separate from the mind/body combination. His Holiness explained that when, in due course, the Buddha encountered his five former companions in the Deer Park outside Varanasi, they recognised a change in his demeanour and asked him to teach what he had realized. Consequently he taught them the Four Noble Truths—the truth of suffering, the truth of its origin, the truth of its cessation and the truth of the path to that. In terms of what they needed to do, he explained that suffering must be known; its origin must be overcome; its cessation must be achieved and the path to it must be cultivated. However, in terms of a result, he clarified that although suffering must be known, there is nothing to be known. Though its origin must be overcome, there is nothing to overcome. While cessation must be achieved, there is nothing to be achieved and despite the need to cultivate the path, there is nothing to be cultivated. His Holiness observed that the Buddha identified 16 characteristics of the Four Noble Truths, four pertaining to each truth. The four characteristics of the truth of suffering are that it is impermanent, in the nature of suffering, empty and selfless. His Holiness made clear that on one level we can understand impermanence to mean that life ends in death. At a subtler level this means that things arise, abide, decay and end in destruction. Subtler still is the understanding that the disintegration of a phenomenon is brought about by its very cause. Thus, change to our psycho-physical aggregates, our mind/body combination, derives from their cause which is karma and mental afflictions. 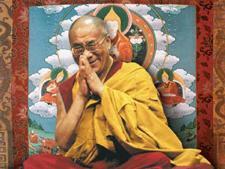 “What is important to recognise” His Holiness went on, “is that suffering is rooted in ignorance. We will not overcome it until we counter the ignorance that is a distorted view of reality. We remain subject to that ignorance so long as we think of the ‘I’ as an independent self. Yet when we search for such a self as an entity independent of the mind/body combination, we find nothing. We cannot find such a self among the five psycho-physical aggregates that make up the mind/body combination, nor can it be identified with consciousness. “Just as cart is designated on the basis of its parts, so a person is designated on the basis of the psycho-physical aggregates. Nagarjuna explains that cessation comes about through the elimination of karma and mental afflictions. Karma and afflictions arise from conceptual thoughts, which come from mental exaggeration or fabrication. Fabrication ceases through (understanding) emptiness. We can gain experience of emptiness if we make a steady effort. If we read Nagarjuna and his followers’ works we can see how they thoroughly explain that there is no independent self. In responding to questions from the audience His Holiness discussed which is realized first, the selflessness of persons or the selflessness of phenomena. He quoted Nagarjuna’s ‘Precious Garland’ that says that as long as there is grasping for the psycho-physical aggregates, there is grasping for a self of persons. However, in his medium and great presentations of the ‘Stages of the Path’, Je Tsongkhapa presents the selflessness of persons first and the selflessness of phenomena later. 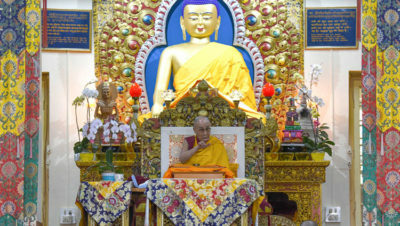 His Holiness remarked that since the Buddha was thorough in his teachings, we need to be thorough in our studies. His Holiness concluded that in addition to the need to completely tame the mind it is also necessary to sustain the body and it had reached time for lunch. He will continue his teachings tomorrow morning.